Don't take it from me, a guy who was basically birthed, then incubated inside a rice cooker, take it from Roger Ebert, whose love of the rice cooker translated into a full-length book on why everybody needs one. His book focuses as much on the philosophy of eating—a feat for food-fan who hasn't eaten in four years—as it does on cooking with a rice cooker. But his theory and practice of cooking with the pot is one of practicality for someone with minimal space or no money. It doesn't even require an expensive rice cooker, just an basic electric one with on, off, high and, low. So my thesis is: Everybody needs a rice cooker. It just depends on what kind. I don't want to get into cultural or racial stereotyping, but if we're talking in broad, general terms, most Asians have a rice cooker and most non-Asians do not. That should change! 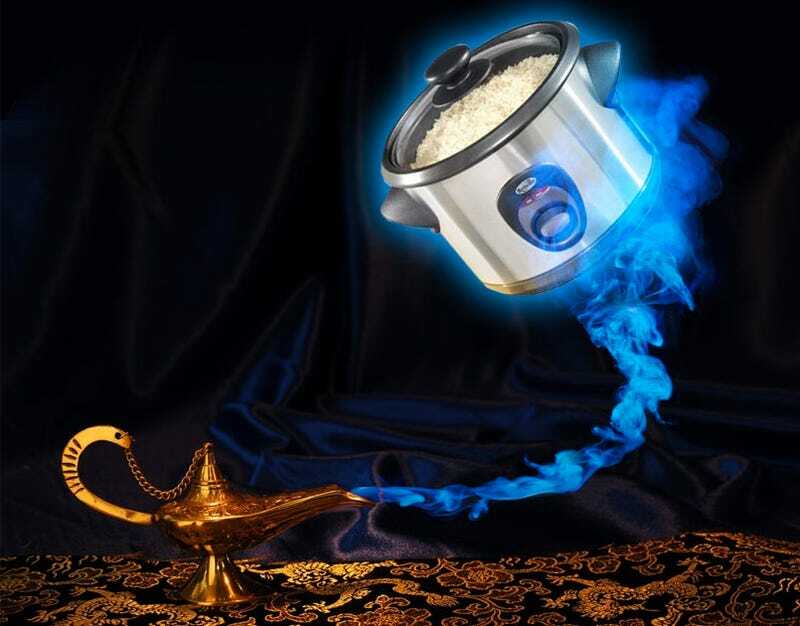 If you check Ebert's original blog posting, he'll outline various tips and tricks to using a rice cooker. Throw in a bunch of ground flaxseed, sliced and washed fruit and you've got oatmeal. Toss in soup, beef, vegetables and chili, and you've got better soup. Take out some soup, and that's a stew. And so on. All this in a $20 rice cooker. For those of you who are already familiar with the benefits of having a rice cooker, take my personal advice and go high end. This means you're spending $150 or $200 $250 on a model from Zojirushi or Panasonic. Good. Now you're going to make some rice. I recently upgraded to one Zojirushi after years of using a rice cooker that was, if not 2/3 of my age, then at least half. It had one button, and relied on you to do all the calculations for time, rice type and water content manually with a slide rule and graph paper. In a world where you don't need to remember more than three phone numbers because your smartphone, computer and Gmail have them all memorized for you, this sounds ridiculous. No more! With these, all you have to do is pick a rice type, find the appropriate rice indicator and fill the pot up to that marker, and you're done. The finished rice is optimized, and honestly, tastes better than what you would have done yourself. For example, cooking brown or purple rice was always a gamble before. You'd do it because it was healthier than plain white rice, but getting the consistency right, to match white rice, is difficult, and you'd end up with something that's too tough or too weird tasting. Now, all rice tastes like white rice.